Take a look at this map below. Have you ever seen a map or sign like this? Did the glass have writing, etching or graffiti on top of it? A lot of these signs are put in public areas where a lot of transit occurs. This makes them a prime target for vandals. A simple key, rock or any small sharp object can do a fair amount of damage to this material. Owners of these signs find themselves in stressful situations when needing to clean up these panels. Do you invest in an entire new sign? Should you replace the glass in full? How much will it cost and how fast can it get completed? If you have a glass shield on top of your current glass, this is something that prevents all of those worries. Instead of making a strategy of how to fix it, you simply need to remove the protective shield, revealing your original, shiny new glass. 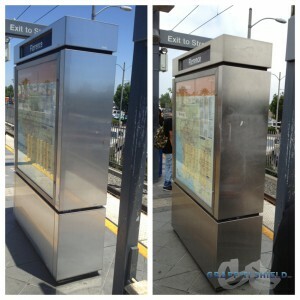 This is the best solution for a fix from vandalism or damages. How often is that you walk into a public restroom, only to see writing across the bathroom mirror? You’d like to take a look in the mirror, touch up, but it alters your view and is just destructive and annoying. Not to mention, this is a pain and a hassle for the business owner and person who is responsible for taking care of these areas. These damages don’t just happen in restrooms, they happen all over where mirrors are. Mirrors with damage on them tend to be unfixable. These need to be completely removed and replaced by a whole new mirror. What a pain. When you own a business or are in charge for the maintenance of a facility, this can cause a major dilemma. It costs a lot of money, takes time and is extremely inconvenient. By installing preventative film on top of your mirror, you can make the repair process much more painless and easy. 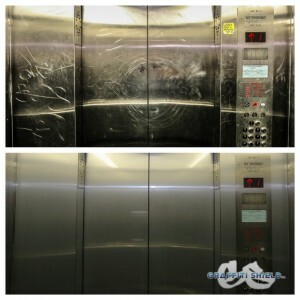 Once damage has been done, you can easily remove the film, exposing your original, shiny mirror. Surfaces made of metal tend to be larger areas than a bathroom mirror. This is why it is so important to take preventative measures before too much damage is done and entire metal panels and doors need to be replaced. As you can see in the images below, the etching and scratching onto the elevator doors is extreme. Imagine if this were at a hotel – the opinion of guests would be very negative. It doesn’t take long to ruin a metal surface, even if it’s only a small portion. These damages add up over time. Luckily, you have an option before replacing everything. 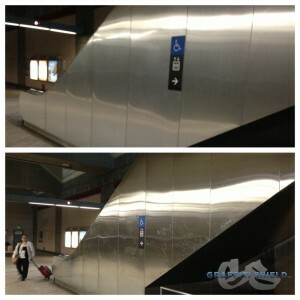 You can install metal protective film on top of your damaged metal and it looks like brand new. There are many different options for these shields – different colors, sizes, shiny, matte, you name it, we can customize it. We can accommodate any shape and size and will match the new shield to your original color. 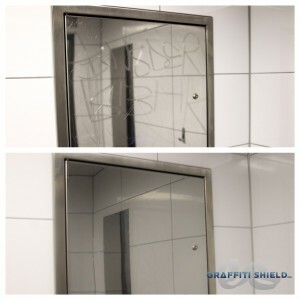 You have probably noticed wear and tear in airports or public areas. It is inevitable that even if it is unintentional, the metal will start to look run down and you will want to maintain/redo these areas. Instead of totally replacing everything, installing a metal shield is the most economical and efficient way to handle damages done to your metal.